Recipes, tips, tricks, and my journey into cooking fabulous food! 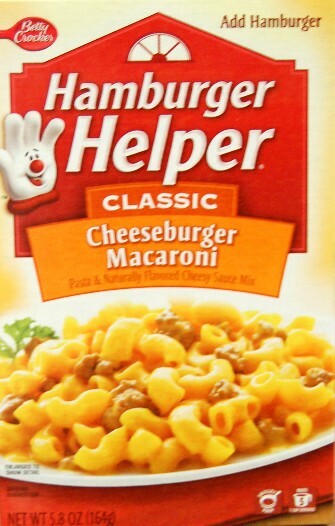 So who out there is going to own up and admit they like Hamburger Helper? Ok, I’ll start…I like Hamburger Helper…ok, ok…I love Hamburger Helper! I love Hamburger Helper and I am not ashamed to say it!!! So this past weekend when I did my meal planning (yes, I started planning all of my meals, as well as Hubby’s dinner, a week in advance) for the week and knew I’d be getting home late from work one night I put Hamburger Helper on the menu. It’s perfect for a busy night because you can just throw everything together in no time and still say you “cooked”! Then the guilt started to set in….I mean it’s not a very Weight Watchers friendly food…or a healthy food in general. So, I got to thinking…someone out there must have come up with a “homemade” version. After a quick search on Google, I found this blog. Awesome!!! Not only does she give you the “base” for the helper recipes, she gives you all different varieties. There are also instructions for making your own “packets” to keep on hand just like the boxed variety. Genius!!! 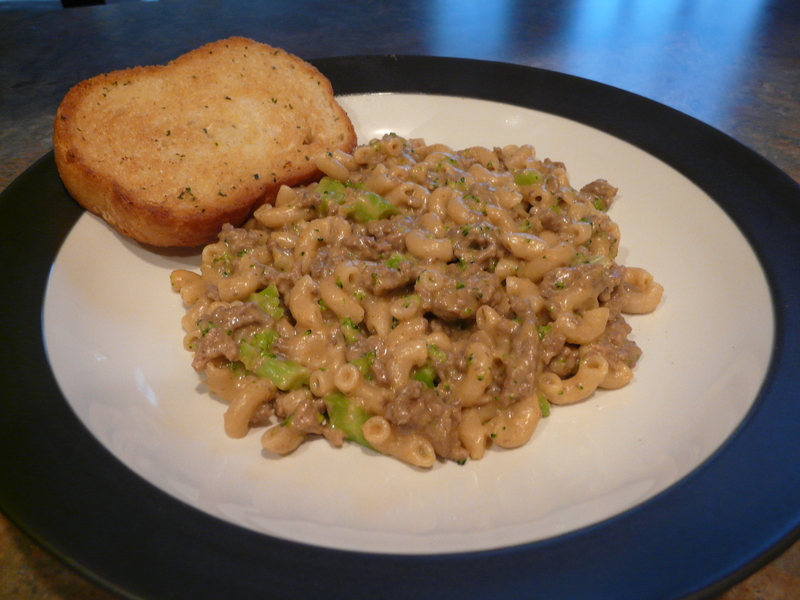 The recipe I’m sharing with you today is a slimmed down slightly altered version of her recipe for the cheeseburger macaroni flavor. Here is where I have to warn you…I thought it was pretty good, but immediately noticed a difference between this and the real thing. Hubby didn’t like it at all. I’ve determined, however that the reason it seems so different is because it is a lot less salty. I did up the salt a little bit in my recipe but I’d suggest starting with 1 tsp. and then tasting it as you go along and add more if you feel the need to do so. My recipe calls for broccoli but you can omit it if you want or you can be creative and add other veggies. Also, it freezes quite well so I made up bags of 1 cup portions with my Foodsaver (you could use freezer bags or plastic containers, but it won’t be as good or last as long) and then freeze them. I pack them in my lunch and this has become a much better option than buying those expensive microwave meals (Healthy Choice, Lean Cuisine, WW Smart Ones, etc.). I just open the pack, put it in a bowl with a splash of fat free milk and microwave it. Tastes great and I don’t have to feel bad about eating food with all kinds of sodium and other additives…and since it’s “Slimmed Down” it is a satisfying meal for only 5 WW points plus. In a small bowl or Ziploc bag, combine all the ingredients for the seasoning packet. Brown the ground beef and drain any excess grease. 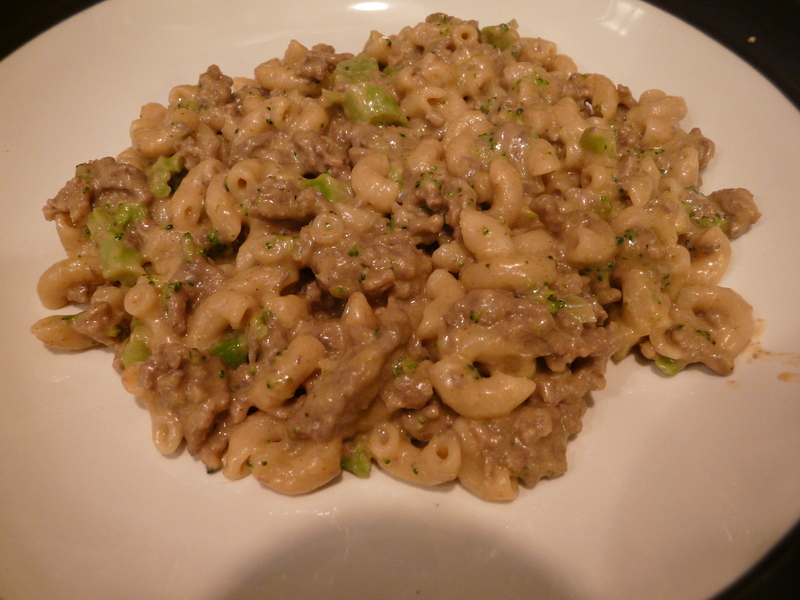 To the browned ground beef, add the hot water, milk, macaroni, and seasoning packet. Bring to a boil and reduce heat to low. Cover and simmer for a total cooking time of about 12 minutes, being sure to stir frequently. Add the broccoli after 7 minutes and the cheese at 10 minutes, stirring until the cheese is melted and well combined. Find What Works For You!